When you give your friend or family member this personalized hoodie, you can bet they'll have never received anything like it. 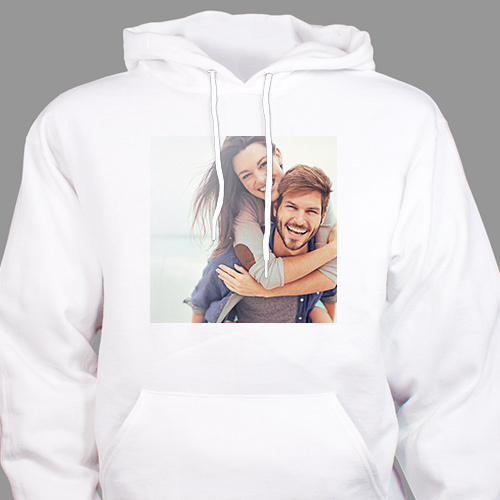 Put their favorite photo on our cozy sweatshirt for a unique gift idea that is appropriate for a number of occasions. This photo hooded sweatshirt is a 50/50 cotton/poly blend, machine washable hoodie. Available in sizes youth S-L and adult L-2XL. Free photo upload is included. Just simply upload your favorite digital photo below. For production purposes, please enter a description that best describes the photo you're uploading. My son loves it!!!!! Great quality hoodie! The picture came out clear with good quality. I’ve already purchased another product. Additional Details Whether the occasion is a birthday, the holidays, or a sporting event, our photo hoodie will look great and give the event a festive flair. Our Picture Perfect Personalized Photo T-Shirt would be another great gift option.